Pizza Hut is baking hamburger patties wrapped in pizza dough and calling them "Hut Burgers" over in the island country of Cyprus. - The Texas BBQ Hut Burger comes filled with a beef patty, spicy BBQ sauce, bacon, cheddar cheese, and fresh tomatoes. 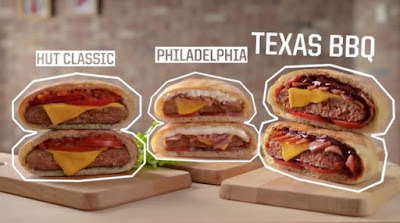 - The Philadelphia Hut Burger is less named for the city and more named after the brand of cream cheese (in some countries, including Cyprus, they call it "Philadelphia" or "Philadelphia cheese" rather than "cream cheese"). It features a filling of a beef patty, cream cheese, bacon, cheddar cheese, and fresh tomatoes. - The Hut Classic Hut Burger includes a beef patty, marinara sauce, cheddar cheese, and fresh tomatoes inside. 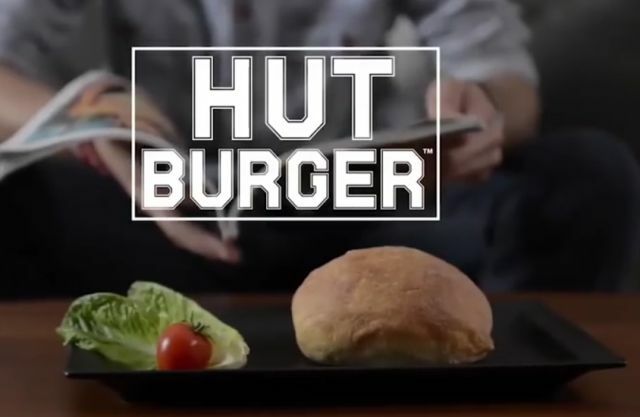 This isn't the first time Pizza Hut has played with the pizza + burger idea. They've offered a cheeseburger-crust burger in several countries, including our neighbors up north. Photos via Pizza Hut Cyprus.